Wigs / All About Lace Front Wigs! All About Lace Front Wigs! For the most natural look with wigs, it's important to choose a lace front wig! These wigs are so natural looking that they were originally used by celebrities in Hollywood to give actors and actresses an undetectable style to fit the acting role. Thereafter, many people began to wear lace fronts for daily wear! We have a very large selection of lace wigs for women of any ethnicity. Our lace front wigs for black women are fabulous and trendy and these wigs can be worn by any woman for a beautiful and natural look. We love lace front wigs for many reasons, from their high quality to styling versatility. There are also many different reasons people wear lace frontals, from hair loss due to alopecia, cancer treatments, other diseases, medications and of course, fabulous fashion! It's important to us that we give the best education and variety possible, so that you are knowledgeable and informed before choosing the best wig for you! Why Choose a Lace Front Wig? A lace front wig is a wig that has a thin, nearly invisible lace material to which hairs are tied in one by one. The result is very natural looking hairline and the illusion that the wig hairs grow from your scalp. Are Lace Front Wigs More Expensive? Lace front wigs can be more expensive than wigs without a lace frontal, but that's because they are high-quality and look the most natural. For a look that's undetectable and has great styling versatility, lace front wigs are certainly worth the money! Lace front wigs are our favorite here at Wigs.com! So many new and beautiful styles for wig lovers available from some of our favorite brands, it's hard to choose! Check out which wigs are the best here! Are Lace Front Wigs Worth The Money? Absolutely! Lace fronts are the perfect solution for a natural looking hairline with wigs. This can boost your confidence and even give you more styling versatility as you can style a them off the face. Do Lace Front Wigs Cause Hairloss? Lace front wigs do not cause hair loss or breakage and are very safe to wear over natural hair. In fact, one benefit of wearing lace wigs is the protection of the biological hair underneath. While washing and styling hair is a fundamental part of many people’s daily hair care regimen, damage or breakage can often occur as a result. Human hair lace front wigs are great for wearing over natural hair especially when fine or thin. Lace front wigs are not the cause of damage to the hair along your hairline. Thinning hair can occur with improper lace front wig application, removal, and poor edge care rituals when wearing your wig. Our natural hairline contains delicate hairs that are not as flexible or rich with the same degree of elasticity as that of the rest of the biological hairs on our head. This unique quality leaves them vulnerable to damage and even patchy hair loss when we inadvertently apply adhesives or tape on top of our natural hairline or fail to use the appropriate adhesive removal solution to remove wigs after wearing. Therefore, any hair damage you might be experiencing while wearing a front lace wig often has more to do with your application, removal and wig care practices rather than the wig itself! We all know that accidents happen. Whether you are a bit too rough taking off your wig at the end of the day, or failed to store it properly, tears and tangles can happen in any wig - especially lace front. But there is no need to fret. Fixing a lace front wig is easier than you might think! Lace front wigs allow you to get the best bang for your buck when you're buying one of your first wigs or hair toppers. Not only do lace fronts come in a wide variety of sizes, colors, and textures, but they are available in both synthetic and human hair as well! What Is A Lace Front Cap Construction? Various cap designs focus on providing the wearer one many different benefits: from added volume at the crown, multi-directional hair parting, a more natural hairline, natural hair growth patterns, or even scalp cooling and comfort. Some caps combine two or more of these benefits in one wig design! When searching for the right wig cap, it's important to know which of these benefits are most important for you. Amore wigs offers synthetic and Remy human hair lace front wigs designed for optimal style and comfort. Enjoy a natural and contemporary look with Amore! Belle Tress offers a stylish and expert-crafted selection of synthetic lace front wigs. Belle Tress wigs are trendy and incredibly natural looking with heat-resistant synthetic wig fibers and color selections designed to perfection! Ellen Wille wigs boasts natural styles and looks that are designed to suit you! for elegance and beauty, choose Ellen Wille's gorgeous lace frontal selection! Envy wig designs are known for fabulous colors and amazing movement! For luscious volume and a look that wows, choose Envy! Their lace front selection embodies a modern and daring flair to let the best you shine. Estetica’s innovative wig collection has the latest in lace front cap designs and a flare for staying ahead of the trends. This natural hairline lace front wigs selection keeps your wig wearing undetectable, blending perfectly with your natural hairline and keeping you flawless all day long! Gabor wigs are popular for elegant, classic, shorter styles. Some of the lightest and most comfortable lace front wigs available can be found among the Gabor collection! Shop Gabor and start getting super chic! HIM by HairUWear offers options such as lace fronts and 100% hand-tied wigs made specifically for men! We carry a wide selection of wigs for men in synthetic hair, which means these pieces are easy to style and easy to take care of. Please note that our men’s wigs are designed with a lot of hair so you can take them to a hair stylist to be cut to look look that best suits you! Jon Renau SmartLace Human Hair wigs are some of the most well-crafted, and natural looking wigs on the market. The lace front is ready-to-wear and creates the look of natural hair growth along the front hairline. The lace front is designed with a fine, sheer material to which hairs are individually hand-tied! Amazing! Jon Renau is an industry-leading wig manufacturer with fashion forward color selections and styles! Shop Jon Renau for precision cuts and innovative cap designs that bring out your true inner beauty. Louis Ferre wigs introduces new technologies to fashion lace front wigs and hair pieces. These wigs offer comfort and a natural look has set a new standard of excellence in the world of wigs! The Noriko wigs collection is hand-made from the high-quality materials. Whether you are looking for comfort, quality or fashion, Noriko has it all! Noriko has amazing color technology with multi-color tones on a single hair strand! Shop Noriko and experience the future today! The Raquel Welch Fall Collection showcases a brand new variety of lace front wigs in beautiful styles that are easy, effortless and always timeless! Introducing the some world’s most luxurious lace front wigs, the Raquel Welch Couture Collection is as close to perfection as you can get! This gorgeous collection features 6 lace front wigs and 1 human hair top-of-head piece. 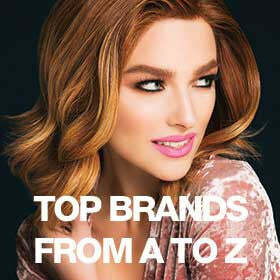 Raquel Welch wigs is a top selling wig line for many reasons! From the classic and natural look and feel to the variety of colors and styles to ensure you get the perfect fit for you. Shop Raquel Welch's lace front wigs for a completely natural look that's perfect for everyday wear. Rene of Paris synthetic lace front wigs are ready-to-wear and have you looking and feeling beautiful in no time! These stunning designs are enhanced by years of creative excellence! Rene of Paris is known for high-fashion styles with naturally blended color selections. Vivica Fox is a model, actress and even producer! Now, she is the face of this stylish and popular collection of wigs and hair extensions. One of the most innovative in the business, this lace front collection is fabulous and fierce for a reason! Wig Pro offers an chic and stunning selection of lace front wigs made from high quality materials and cap designs. Enjoy a selection of cuts and styles that are designed to turn heads everywhere you go!